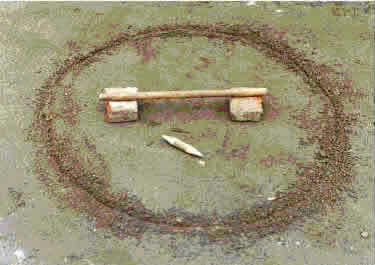 This popular outdoor game is has poor boys mostly Kutti-Donne includes a thick stick-Donne and a smaller stick kutti, which is half the size of Donne. After a venue is decided of first strike is decided by the toss of a coin. A small pit is dug (Kuttida Guri), and the Kutti is placed on it. The player with help of his Donne must throw the ‘Kutti” to a safe place. In doing so, if the Kutti is caught by the members of the fielding team, the player loses the right to play. If the Kutti, land safely a member of the fielding team throws the Kutti back to the striker. If the player files to connect and falls near the pit the player is declared out. But if the player is successful is straiking the Kutti he gets two more chances to play the Kutti. The game to decided on the total number of points, which is in terms of ‘Chukke’. In fact ‘Chukke’ is the distance between the Kutti and the pit and is measured by ‘Donne’. One Chukke is equal is seven times of Donne. Fun instance if the distance between Kutti and the pit is 35 ‘Donne’, then the player garners five points. A small circle of four feet diameter is drawn. In the centre a small oblong shaped hole is dug which should be smaller than the gilli. Two teams are formed. One bat and the other fields. ground, the batsman is out and the second player tries to hit the gilli. If the gilli is not caught, then the distance from the hole to the place where the gilli falls is measured with the danda. Each danda equals one point. The fielder stands where the gilli had fallen and tosses it to the batsman. The batsman tries to hit the gilli while it is in the air. If it falls in the circle then he is out, if it falls outside the circle then he taps the tapered end and lifts it in the air and strikes while it is in the air. He gets three chances to hit the gilli. If he does not hit it, or is caught, he is out.